Hiring a new candidate is a tuff job. Choosing a right candidate for the right job is very crucial. Your firm or company depends on people who work there and if the workers are not devoted to their jobs than your company can collapse. Not only candidate do mistakes in the interviews but sometimes the interviewer can also make mistakes. And those mistakes can affect your company in many ways. 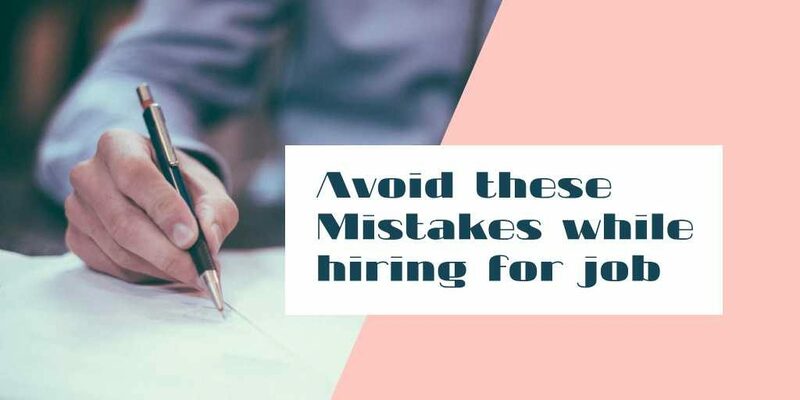 Here are some common mistakes an interviewer must avoid during an interview process. While you are looking for a candidate don’t stick to any kind. Look for diversity in skills, age, experience, gender and background. All of these will bring so much new ideas and skills in your work. These things can help your organisation to grow more in different ways. During hiring, it is must that you specify the candidate’s job role and his overall responsibilities for the particular position. This can help the candidate to conclude more. Always remember that only qualification never describe a person. You need to see his skills, abilities and passion toward his work. Sometimes even less qualified person can achieve the success which high qualified person can’t. Not only candidates need preparation before interviews but the interviewers also need some sort of preparation before conducting one. So do your research and always be prepared before conducting interviews. You have to accept it that no one can be perfect. So don’t look for the perfect candidates, just find the better one. Your hired person will move toward the perfection with time and experience. Numerous interviewer feel that they are superior than the candidate so they keep their bossy behaviour but it looks haughty. You need to be polite and make the candidate feel comfortable with you. After all he is also a human and he will certainly memorize you for your goodness.